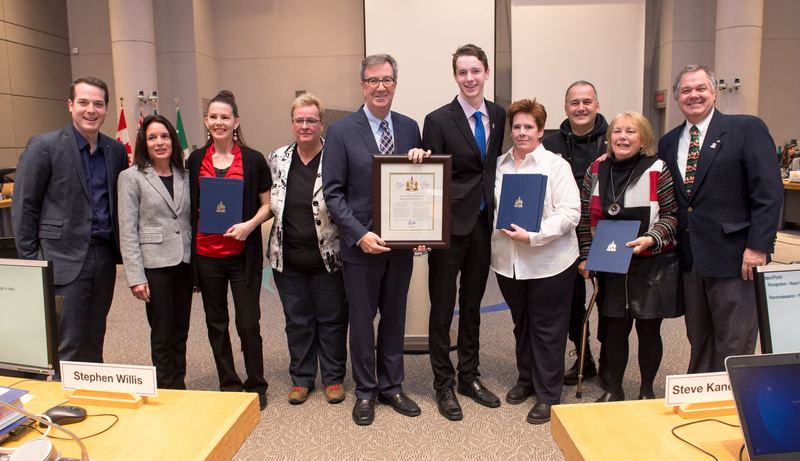 Ottawa – Mayor Jim Watson, with Councillors Mathieu Fleury and Jean Cloutier, recognized the Ottawa 2017 Volunteers at today’s City Council meeting by presenting them with the Mayor’s City Builder Award. Ottawa 2017’s volunteer force is over 2,500 strong and the presentation was to recognize everyone who has volunteered their time over the last 12 months. Over the course of 2017, volunteers have donated in excess of 25,000 hours, spanning over 100 events, including Red Bull Crashed Ice, JUNO Awards, Inspiration Village, Kontinuum, La Machine, Canada’s Table, Ottawa Welcomes the World and Miwàte. On a daily basis, Ottawa 2017 volunteers have demonstrated exemplary qualities including strength, initiative, kindness, hospitality, leadership and team spirit. Ottawa 2017 would not have been possible without their support. From working outside for long stretches in minus 30-degree weather during Red Bull Crashed Ice, to plus 30 degrees during 14-hour days with La Machine, they remained dedicated and smiling throughout. The volunteers set an example that has inspired everyone who interacted with them, from the Ottawa 2017 team to the millions of people who visited Ottawa during the year. They have set a new standard in volunteerism and their contributions will be remembered for years to come.